The Rushdie Rules have gone viral: Ayatollah Khomeini's 1989 masterstroke of imposing a death edict on Salman Rushdie has now spread and become the hum-drum response of Islamists to perceived insults. By telling the West what can and cannot be said about Islam, Khomeini sought to impose Islamic law (the Shari'a) on it. The recent round of violence against The Innocence of Muslims, an anti-Muhammad film on YouTube, has mostly taken the form of demonstrations and violence against Western buildings (diplomatic, commercial, educational) in Afghanistan, Bahrain, Bangladesh, China, Egypt, India, Indonesia, Iraq, Israel & the Palestinian Authority, Kuwait, Lebanon, Libya, Malaysia, Morocco, Nigeria, Pakistan, Qatar, Sudan, Syria (including the American-backed rebels), Tunisia, Turkey, and Yemen as well as in Australia, Belgium, France, Germany, and the United Kingdom. So far, about 30 people have lost their lives. The Iranian and Egyptian governments both want to get their hands on the filmmakers of Innocence, whom they blame for the violence. 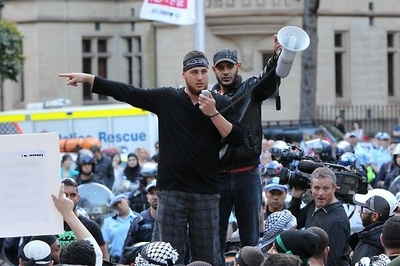 Islamists took over parts of Sydney's Central Business District on Sep. 14. Anti-Islamic provocations have proliferated: Rushdie had no idea what he was walking into, as he explains in a book published this week. Others, such as the American soldiers who burned Korans in Afghanistan in early 2012, likewise unwittingly set off Islamist disturbances. But Florida pastor Terry Jones, the group behind The Innocence of Muslims, and the French weekly Charlie Hebdo, as well as anti-Islamic groups in Canada and Spain, overtly want to rile Muslims. Thus have Islamists and anti-Islam activists developed a symbiotic relationship in which the one spurs the other. The new censor? Joint Chiefs Chairman Gen. Martin Dempsey called Florida pastor Terry Jones on Sep. 12 to ask that he not support an anti-Islamic video. Individuals hold government hostage: When Jones spoke of burning copies of the Koran in 2010, he received calls from no less than the U.S. commander in Afghanistan, the secretaries of defense and state, the attorney general, and the president of the United States, all pleading with him to desist. 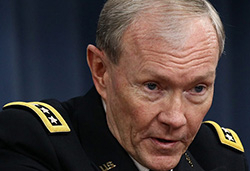 Last week, the chairman of the joint chiefs of staff picked up the phone to chat with him. Never before could random individuals drive policy like this. French humorist Jean-Jacques Sempé drew a cartoon in 1989 capturing this reversal: as Rushdie is working furiously on his typewriter under the gaze of the fifteen policemen guarding him from Islamists, one Bobby yells into his walkie-talkie, "Close the airports!! He wants to write Volume Two!!!" If Rushdie never wrote a volume two, Jones returns repeatedly into the limelight. A growing separation of civilizations: The famous clash of civilizations does not exist; in fact, a separation of civilizations is underway. It takes many forms, from Muslim-only enclaves in the West to matrimony, economics, education, culture, media, entertainment, travel, websites, and even time-keeping. How many tourists, for example, will sun themselves on Tunisian beaches or explore Egyptian antiquities any time soon? "Obama, we love Osama": That's what a crowd in downtown Sydney, Australia chanted. 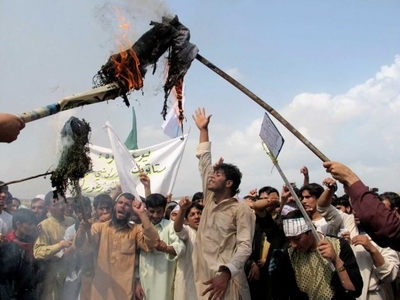 Meanwhile Afghan, Indian, and Pakistani Islamists burned Barack Obama in effigy. Such hatred of Obama is the more remarkable given Obama's many childhood connections to Islam, his 2007 prediction that his presidency would witness a major improvement in relations with Muslims, his strenuous efforts to win over Muslim opinion on becoming president, and the initially favorable Muslim reaction to him. In fact, his standing has plunged to the point that he is as unpopular or more so than George W. Bush. Afghans burn an effigy of Barack Obama in Khost on Sep. 15. Minimal impact on U.S. presidential elections: Polls show that voter attitudes toward Obama and Mitt Romney have hardly budged over the past six months, suggesting that Islamists on the rampage will have little impact on the election results. Western civilization in the balance: Islamist aspirations grow with improved communications and weakened Middle Eastern governments, ultimately posing an existential question for Westerners: Will we maintain our historic civilization against their challenge, or will we accept Muslim dominion and a second-class dhimmi status? In sum, Islamists want to impose Shari'a, Westerners are divided, and the battle of wills is just getting started. Sep. 22, 2012 updates: (1) Despite the government of Pakistan trying to preempt problems by declaring yesterday, Friday, a national holiday, called the "Day of Love for the Prophet" (Youm-e-Ishq-e-Rasool), violence erupted in Peshawar, Islamabad, Lahore, Rawalpindi, Multan and Karachi, leaving some 19 dead and 160 injured. Movie houses and churches were specifically targeted. 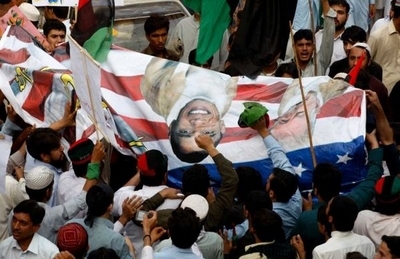 Pakistani protesters hold a banner depicting Barack Obama and Terry Jones atop bodies of dogs and against an American flag at a rally in Peshawar, Pakistan on Sep. 20. (2) Pakistan's Railways Minister Ghulam Ahmad Bilour minister offered $100,000 on for the killing of Nakoula: "I announce today that this blasphemer, this sinner who has spoken nonsense about the holy Prophet, anyone who murders him, I will reward him with $100,000. I invite the Taliban brothers and al-Qaeda brothers to join me in this blessed mission." Making matters confusing, a spokesman for the Pakistani prime minister disassociated the government from this statement. Sep. 23, 2012 update: Demonstrations took place in Greece and Hong Kong today. Oct. 14, 2012 update: Approximately 10,000 Muslims protested for four hours outside the London office of Google on Buckingham Palace Road, part of an attempt to make The Innocence of Muslims unavailable on YouTube (a subsidiary of Google) in Britain. They carried signs with "We love our prophet more than our lives," "Freedom of speech = Hatred of Muslims?" and "Prophet Muhammad is the founder of freedom of speech." Speeches were greeted with impassioned cries "Allahu Akbar" and "Mohammad rasul Allah." A YouTube spokesperson brushed the demonstration aside: "This video - which is widely available on the Web - is clearly within our guidelines and so will stay on YouTube." 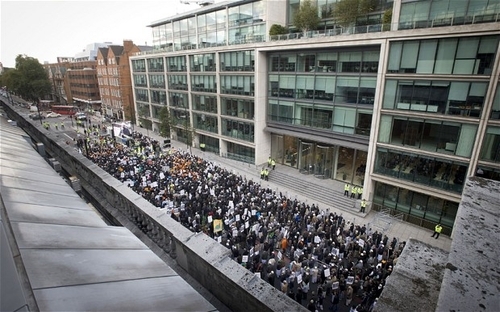 Ten thousand Muslims demonstrating outside of Google's London office on Oct. 14. July 8, 2013 update: See my blog, "Did the "Innocence of Muslims" Video Play a Role in the Benghazi Attack?" for a discussion of the contentious issue that has arisen over the developments in Libya on Sep.11, 2012. Related Topics: Freethinking & Muslim apostasy, US policy | Daniel Pipes receive the latest by email: subscribe to the free mef mailing list This text may be reposted or forwarded so long as it is presented as an integral whole with complete and accurate information provided about its author, date, place of publication, and original URL.